P-2862. A COLIMA SEATED DRINKER-BALLPLAYER, COMALA REFINED STYLE, PROTOCLASSIC ca. 100 B.C. - A.D. 250. Height: 13 in. (33 cm.). Provenance: Inscribed on the base with the number “A40” and “Primus-Stuart” which signifies the Primus-Stuart Gallery partnership in Los Angeles during the late 1950s to the early 1960s. Ed Primus and David Stuart were distinguished dealers in ethnographic art in Los Angeles during those years. David Stuart operated his own gallery on La Cienega Blvd. for many years afterward. 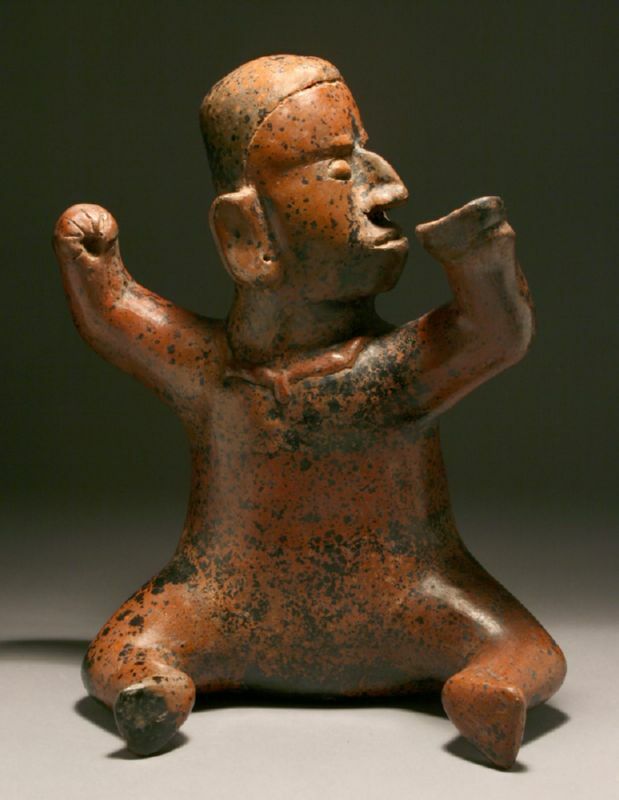 This shamanistic ritual drinker with a determined expression holds a cup above his lips as if to take a drink in his left hand, and is in a throwing position with his fisted right hand. The leftward orientation is indicative of a shamanistic ceremonial symbol. This piece exhibits an exceptionally rich Colima red to reddish-brown slip with black mottled manganese oxide deposits upon the surface.